It’s a visual (marketing) world we live in. And content is one of your best marketing vehicles. More and more content is being created and consumed via video, social media (which is highly visual), infographics and more. And that which is actually written needs to factor in ‘readability’ - which means including images and graphics. 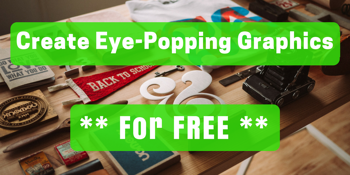 As a small business, entrepreneur, solopreneur, or anyone that lacks the resources to create professional looking graphics, this post is for you. Having a block of text for your blog or marketing messaging, or publishing social media without an image, will not receive as much attention as when it’s accentuated with graphics. Case in point, Twitter - Tweets with images receive 2x the engagement! Everything you put out there should include at least one graphic. And good looking visuals aren’t as hard to create as you might think. It’s important to have a set of tools that can help you save time and money, and look great in the process. There are many sources of free images and photos available (as I learned from Ray Manleys “Ultimate Guide to Free Images”) but the one I like best is Unsplash. Unsplash (https://unsplash.com/) is a streamlined, easy to use resource that has many free, high-resolution, high quality photos. All photos published on Unsplash are licensed under the Creative Commons Zero, which doesn’t require credit to be given. This means you can copy, modify, distribute and use the photos for free, including commercial purposes, without asking permission from or providing attribution to the photographer or Unsplash (However, they encourage giving credit to the photographer if possible, since they generously donated their photographs for use by the public). To use Unsplash, simply search by keyword for the type of image you want (e.g., "create") and you’ll get a collection of photos to choose from. Sometimes you have to adjust your search term, but in my experience, there is always an ample supply of images (Unsplash adds 10 new images every 10 days). After you find the image you want, download it to your computer. Once you’ve identified they image you want to use it’s time to edit it for your specific purpose, whether that be as a blog title, a social media post, an ad, email header, etc. Whatever the need, the image needs to be sized correctly, cropped, and designed to include any text or effects you have in mind. 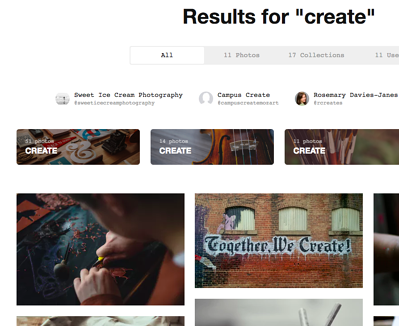 As with image resources, there are many free design resources, but the one I use is Canva (https://www.canva.com). The site is pretty self-explanatory. You choose a template to suite your need (e.g., Facebook post or Infographic), or you can use your own custom dimensions. You can work with one of their many free, pre-made design templates, or you can create your own design by uploading your own image, such as the one you got from Unsplash. With Canva’s simple drag-and-drop interface, size your image for how you want it to look in the template, add text and design elements, and play around with the different font options, point sizes, colors, transparency levels, and more until you have the graphic looking the way you want. When done, download the final product to your computer. It should be noted that both Unsplash and Canva have premium versions of their service, but the free version is more than adequate for everything I need to do, and everything I’ve described here you can do at no cost. So there you have it, a free, 2 step, easy process for creating high quality, professional looking images for your small business marketing campaigns.